1. Embedded Resistor PCB or call Buried Resistor PCB are receiving attention and considerable development efforts to enable electronic devices with higher performance. A resistor is an important passive device in an electric circuit. Embedded Resistor PCB accomplish this by moving discrete passives from the surface of the printed wiring board and placing them in the PCB. This frees up the surface space for the placement of more active components that increase functionality. To enable high performance devices, an Embedded Resistor PCB must achieve a tolerance and power ratings that allows the PCB design and manufacture to meet electrical timing and circuit signal quality requirements. The stability of the material when subjected to typical PCB processes will also affect the final tolerance of Embedded Resistors PCB. 2. Embedded Capacitor PCB or call Buried Capacitor PCB is a technology developed to address some needs. The technology improves electrical performance, frees surface real estate, and eliminates solder joints, Also to meet the demands for electronic devices include higher frequencies, lower voltages, and larger currents, end users require increased functionality, smaller form factors and lower cost. Current standard capacitive material used in the high end computing industry is mainly the 50micron(2mil) dielectric thickness material, mostly utilized for telecom and networking applications. 3. Embedded Passives PCB, in general, yield a more reliable PCB by reducing the number of solder joints, reduce rework on the assembly, and lowers total system cost.The demands for higher performance and low signal losses in electronic products continues to drive the development of electronic systems with passive devices embedded in multilayer PCBs. To improve high performance devices,an embedded passives must have a specified value with a tolerance that enables the PCB design to meet electrical timing and circuit signal quality. Including embedded resistors or embedded capacitors in PCB designs allows the passives to be placed more optimally in the circuits. Panda PCB generally use Embedded Resistor material including Ohmega (OhmegaPly),Shipley (Insite),Ticer (TCR). And the Embedded Capacitor material including 3M (C-Ply),OAK-MITSUI (BC12TM),DuPont (HK series),Sanmina (BC-2000),Ticer (TCC). 1. Improves reliability through elimination of solder joints. 2. Increases active component density and reduces form factors. 3. 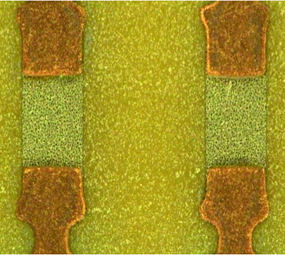 Improves signal routing through elimination of SMT vias. 5. Improves line impedance matching. 6. Reduces EMI, crosstalk and noise. 7. Shortens signal paths and reduces series inductance.